You are here: Home / Wedding Products / Jewelry / Bridal and Engagement Rings / An Amethyst Engagement Ring? One of the glorious advantages of shopping online is you can find items that are difficult or impossible to find locally. This applies to engagement and wedding rings as well. Every retailer carries a nice inventory of diamond rings, but when it comes to the more unique varieties, selection frequently falls short. An engagment ring with amethyst gemstones, for example, is relatively rare. The amethyst symbolizes (among other attributes) sincerity, stability, peace, balance, and tranquility. Presenting an engagement ring featuring this gemstone is promise of a marriage built upon a foundation of these appealing qualities. When shopping for any engagement ring, the variables are metal, main stone cut, accent stones cut, various quality aspects, and craftsmanship. You will find amethyst in various shades of purple and green. Some popular variations of engagement rings are above; find these and others on the MyOnlineWeddingHelp.com Green and Purple Amethyst Engagement Rings page. Also, Gemvara (the quality merchant that the carries these rings) runs periodic offers, which can be found here. 1. Audrey Ring. Princess Amethyst Sterling Silver Ring with Diamond (around $600). Like all the rings shown here, stone(s) and metal(s) are fully customizable. 2. Spotlight Ring. Round Amethyst 14K Yellow Gold Ring (around $600). 3. Acadia Ring. 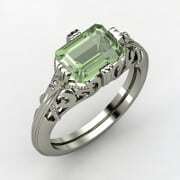 Emerald-Cut Green Amethyst Sterling Silver Ring (around $425). 4. Penelope Ring. Oval Amethyst 14K White Gold Ring (around $975). 5. Beaded Solitaire Ring, Round Amethyst Sterling Silver Ring (around $500).